Aerate your lawn. Tightly packed soil restricts root growth and prevents water and fertilizer from penetrating the soil (increasing stormwater problems). Core aerators remove plugs of soil throughout the lawn. Holes give grass roots space to grow and helps prevent weed growth and thatch problems. Mow high and leave clippingss. Be sure your mower is set to three inches. Tall grass helps to conserve moisture and promotes root growth and shades out weeds. Sharpen your mower blade at least once a year. Let short clippings fall back into the lawn; they do not contribute to a build-up of a thatch layer. 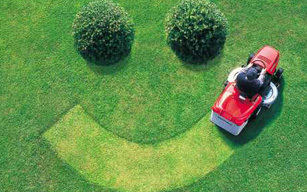 Clippings are a source of nitrogen, so fertilizer can be reduced by 25% or more. Water the lawn to minimize disease and insect pests. A green lawn in Westchester County needs 1/2 to 1 1/2 inches of water per week, depending on the site and turf grass type. Overwatering causes more weed, disease and pest problems than underwatering. Install rain gauges and measure how much you are watering. Water early in the morning. Water applied in the afternoon evaporates too quickly, and watering in the evening can encourage disease problems. Maintain fertile soil. Test your soil every three to four years to determine the amount of fertilizer your lawn needs. Do not overfertilize. The excess can damage the lawn and may feed lake weeds instead of your grass. Leaves, grass clippings and other yard waste. Leaves, grass clippings and other yard wastes should not be left on paved areas where they can wash into storm sewers and into our lakes or streams. As these wastes decompose, they become fertilizer, encouraging aquatic weed and algae growth. They can be composted, tilled into the garden, or collected and put out for special pick-up. Contact your local public works department for pick-up dates. Lawns and many garden plants do not need as much fertilizer as you might think, especially if you use certain grasses and native plants. Excess fertilizer applied to lawns and gardens wash off and pollute streams. Because they contain nutrients such as nitrogen, phosphorus and potassium applied in excess, these nutrients nourish weed growth and algae in our lakes, rivers and steams. Have your soil tested every three to four years. To avoid overfertilizing your lawn, obtain a free soil test so you can determine exactly how much and what kind of fertilizer you need. Follow package directions and apply only the amount needed. Remember to exclude the land area covered by your home and garden when calculating the square footage of lawn you need to cover. Choose a dry, calm day for the application. To reduce fertilizer runoff into waterways, don’t fertilize just before a forecasted rain storm, do not apply fertilizer over paved areas and avoid applying on windy days. Fertilize in the fall. September is best for lawns, with a repeat application in spring (May) if needed. Water soon after applying fertilizer to promote fast absorption into the plants. Store unused fertilizer. Unused fertilizer can be stored in a dry place or given to someone who will use it up. Storing unused fertilizer for later use or sharing it is preferable to disposing of unused amounts. 1996 – Westchester County Pest Management Committee established. 2001 – County Board of Legislators adopts the Neighborhood Notification Law. 2004 – Grassroots Healthy Lawn Program introduced. Determine if you have a pest problem that is significant enough to need control, before you purchase a pesticide. Many pesticides do not solve the problem, they just lesson the symptoms. Most pesticides are not intended for preventative use. Read the label carefully to be sure the product is intended for your particular pest problem. Choose the least toxic product available, buy only the amount you need and apply the smallest amount needed to do the job. Read and follow label directions exactly. In general, pesticides should be applied only on calm, dry days when no rain is forecast for at least 24 hours. Wind and water can carry pesticides into sewers and waterways. Do not apply pesticides over sidewalks, gutters, or other paved areas, where they can easily wash into sewers or waterways. Try not to purchase more than you will need in one year. Most pesticides have a short shelf life (e.g. 2 years). If you have leftover pesticides that you can no longer use, give them to someone who can use them up or store them in the original container. Contact your local public works department for disposal options.